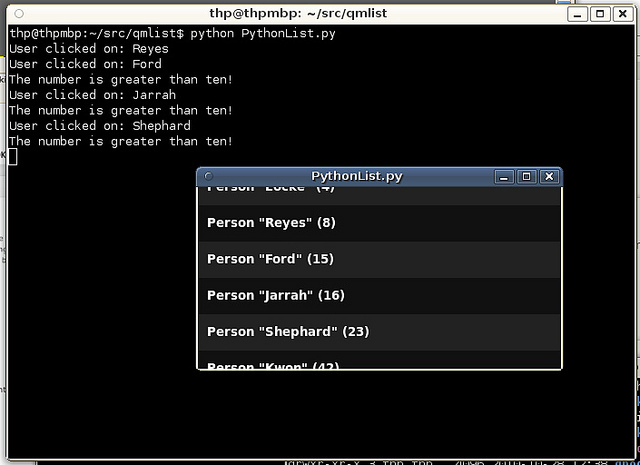 This PySide code example shows you how to display a list of arbitrary Python objects in QML and to get the "real" Python object in a callback when the user clicks on a list item. This is done by wrapping the Python objects inside a QObject. Of course, if you are developing a new application, you can create your model entity objects directly as QObject subclasses, but for adding a QML UI on top of existing Python code, this should be very useful. This is pretty straightforward. If you don't have OpenGL support on your target platform (or you don't want to use OpenGL-accelerated QML), simply remove the line from PySide import QtOpenGL. Create a new QObject subclass that gets your custom Python object (called "thing" in this example) as constructor parameter. You can then define different properties (QtCore.Property) for all the parts of the thing that you want to show in the UI. You will use these property names to access attributes of your object in QML later. You can subclass QAbstractListModel and implement the required methods to provide a proper data model to QML's ListView. Theoretically, you could have multiple columns, but for simplicity, we just use one here, and then access the different attributes of our objects (one object per "row"). The list model here gets a list of (wrapped) "things" as constructor parameter. You could also generate objects on the fly if you want, just make sure that you return the proper value in the rowCount function. For receiving events from QML, there are several possiblities. We simply create another QObject subclass and give it a Slot with one parameter (the wrapper object in the selected row). We pass the wrapper object from QML, and arrive at this point in the "Python world" and can do whatever we want with the object the user has selected. Here follows some generic boilerplate code for setting up the basic QApplication, QMainWindow and QDeclarativeView object tree to display QML. If you don't want to use OpenGL acceleration, remove the lines glw = QtOpenGL.QGLWidget() and view.setViewport(glw). This page was last modified on 20 February 2018, at 15:29.